In the time it took for me to wrestle a Brazil nut out of its shell, my three-year-old daughter stealthily transported 7 rolls of toilet paper from the bathroom to the living room. When I pulled myself away from the nutcracker, it was too late. 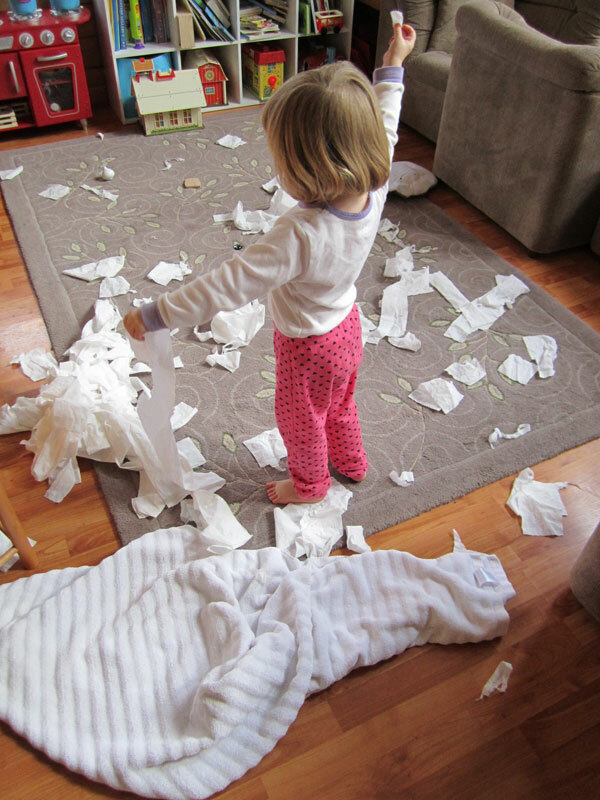 She had created a pathway of "wipe-away" in the living room, around the corner and down the hall. She even used tape. The amazing thing was that all of this had taken place, in a matter of mere minutes. It was highly creative – and really, I couldn’t bring myself to scold her for such an imaginative performance. Instead, I let her continue to play – to see what else developed. After the path, the toilet paper morphed into a dog named Max. Later, it became ribbon “like the ballerinas use”. Eventually, my daughter became a orchestra conductor - throwing Charmin shreds in the air with gusto, while singing the Wonderpets theme song. I was reminded of when I was a kid and my parents and I flew out to Calgary to visit my mom’s brother and his wife. Being in a city was far different from my life back home in the country. For one thing, my aunt and uncle had neighbors. Who lived right next door! In one of the houses was a girl – a bit older than me. Since I don’t remember her name, I’ll just call her girl. The thing about girl was that she knew stuff, about things. Specifically, she knew about toilet paper. Somehow, she and I ended up in someone’s downstairs powder room. And because it was a downstairs powder room, girl and I were able to play there, undetected. Probably for longer than we should have. Girl showed me that if you took a wad of toilet paper and stuck it under the tap in the sink, amazing things happened - especially when you added Kleenex to the mix. We spent nearly an hour, turning someone’s White Cloud (or maybe it was Cottonelle – either way, it was pink and blue) into a several balls of mush that when dry became… giant, hard, purple balls. Wow - that sounds way more dirty than it was. Needless to say, when the adults found us, we were in deep doodoo because apparently, toilet paper was expensive in the 70s. I'm talking diamond ring expensive. Must have been all those pink and blue dyes. Meanwhile, when I returned home from the Calgary trip, I developed a nasty case of chicken pox.